Written and illustrated by dentist Ben Magleby, Sugarbug Doug, is all about sugarbugs, who are out to destroy your teeth and make your breath awful! Sugarbugs are bacteria that live inside your mouth feeding on the sugars you consume, and causing tooth decay and bad breath. 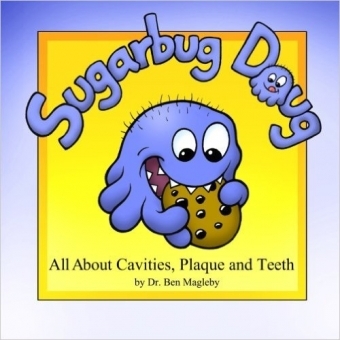 Ben Magleby has written this book to help teach children all about what causes dental decay, and how they can stop it. It lays out how a few easy steps involving oral hygiene habits, dietary choices, and regular visits to the dentist can all help keep the sugarbugs away, and teeth clean and healthy. Kids find this book appealing because It shows them that they have control over their oral health. It gives them the important information they need to take their dental care into their own hands, and shows them that with a few simple steps, they can keep their smiles health for life. This information is presented in a straightforward, kid-friendly fashion, and the bright, expressive and adorable illustrations draw kids and adults alike to this informative and clever book.